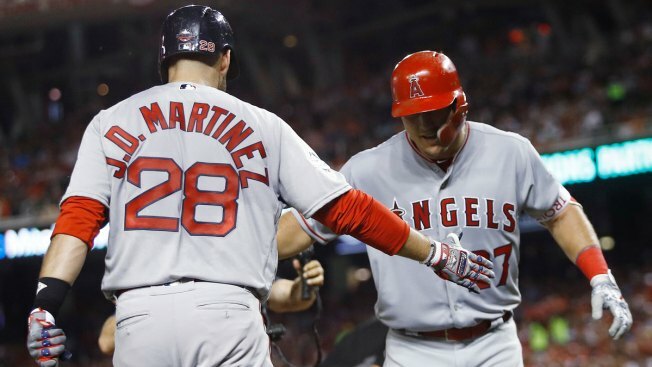 Los Angeles Angels of Anaheim outfielder Mike Trout (27) is welcomed at the dugout by Boston Red Sox's J.D. Martinez (28) after his solo home run during the third inning of the Major League Baseball All-Star Game, Tuesday, July 17, 2018, in Washington, D.C. The American League defeated the National League 8-6 in 10 innings at MLB's All-Star Game Tuesday. A record of 10 home runs were hit during the course of the game. Astros player Alex Bregman was named MVP of the game. Judge homered in the second off Scherzer, the Nationals ace who became the first reigning Cy Young Award winner to start an All-Star Game in his home park. There was another judge at the park besides the Yankees slugger — Brettha Kavanaugh, President Donald Trump's Supreme Court nominee. CORRECTION (July 18, 2018, 6:58 a.m. ET): In an earlier version of this story, The Associated Press erroneously attributed a tweet about the shooting of Trayvon Martin to All-Star Game reliever Josh Hader, among other offensive tweets of his. It's not clear the Martin tweet can be attributed to Hader.